Located in Somerset, Kentucky, the Law Office of Richard Hay has skillfully handled personal injury and wrongful death cases for over three decades. Our lawyers represent individuals and families across the state when they need us most — when suffering because of catastrophic injuries, or a tragic loss, caused by the negligence of another. Father-daughter team Richard Hay and Sarah Hay Knight devote extensive resources to each one of our cases to provide the highest caliber of service and achieve the best possible results. Because of our intense focus on each case, we are able to accept only the most serious cases where we feel we will make the biggest impact. To learn whether our law firm can be of service to you and your family, please call 606-679-2214. As experienced personal injury lawyers, we understand the very serious physical, financial and emotional costs serious injuries cause individuals and families. We pursue maximum compensation for our clients, whether through strategic negotiations or aggressive actions in trial. 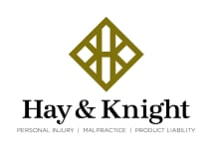 Mr. Hay, a Certified Trial Specialist, is among few attorneys in Kentucky to have won multiple million-dollar verdicts. If we choose to take your case, we will not charge you any fees or expenses unless we recover financial compensation for you. We are truly passionate about supporting victims of car wrecks, truck accidents, medical malpractice, dangerous products and more. If you or someone you love has suffered a personal injury or wrongful death because of someone else's reckless or careless actions, turn to the Law Office of Richard Hay for compassionate, results-oriented legal counsel.